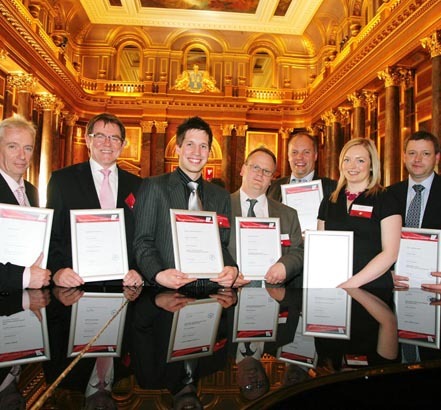 EMILAS winners with their Award certificates at the LIF Annual Luncheon, Draper's Hall, London. May 2009 saw one of the most significant highlights in the lighting industrys calendar - as well as being the Lighting Industry Federations AGM/Annual Luncheon - the winners of the Federations new Energy Management and Innovation in Lighting Award Scheme (EMILAS) were announced. We were delighted with the number of entries received  and their quality  for the lighting award scheme, which focuses on the upgrading of existing installations to improve energy-efficiency and encourages owners/users to upgrade their existing lighting installations, commented LIF President Peter Denny. A prime objective of EMILAS is to give recognition to lighting schemes showing proven energy savings with a minimum 20% improvement over previously installed schemes." The response far exceeded expectations and reflects the dramatic impact of evolving energy efficiency lighting schemes across a diverse range of sectors and applications." Scheme energy performance improvement over previous scheme = 50%. Combined occupancy and daylight monitoring. Scheme energy performance improvement over the previous scheme = 61%. For Burrell Road Industrial Estate, Haywards Heath, West Sussex. Using Venture lamps and incorporating daylight photocells with manual override. Scheme energy performance improvement over the previous scheme = circa 58%. Recessed and surface T5 luminaires incorporating individual intelligent automatic presence and daylight dimming controls. First UK site to use Lumicom waste disposal as part of WEEE Directive. Routine maintenance wiring testing achieved through luminaires with individual controls and double pole isolation switches. Scheme significantly increased lighting performance whilst simultaneously reducing energy usage. Project for Old Oak Depot, Acton. Daylight monitoring and non-occupancy override. Customer required point-for-point replacement and enhanced lighting levels. Scheme significantly increased lighting performance whilst reducing energy for football pitch lighting at War Memorial Sports Ground, Carshalton. Installation comprises 18 Philips OptiVision MVP507 Asymmetric floodlights mounted from 6 to 15m high columns. Scheme energy performance improvement = circa 35%. For indoor sports hall including running track. 54W dual switching IP54 rated fittings. Mini occupancy sensors, Bluewave six-channel controller, weatherproof light level sensor. Staged zone control, daylight monitoring by photocells, timers/programmers, occupancy detection. Scheme energy performance score % change from previous scheme to new = 55% (dimmed output). Appropriate lighting installation for cluster of traders in the town that first had electricity. Shopping street by day, residential at night. Philips Paxton lanterns with 60W CosmoWhite lamps and Lumistep dimming, mostly mounted on wall brackets. Philips Cosmo White, Ra 60 plus, 2800K, 60W. Mounting height varies  approx 5m MH and 30m spacing. Lumistep six hour dimming down to 45W from 12.00 to 6.00am. Scheme increased lighting performance significantly whilst reducing energy usage. Residential, 30mph speed limit area. Harvard LeafNut RF streetlighting central management system controlling 60W Cosmopolis lamps in WRTL Arc lanterns. LeafNut remotely monitors installation, automatically providing lamp fault reports. 6m mounting height, average 35m spacing. Scheme energy performance improvement from previous scheme = 99%. For Bournemouth Pier  decorative purposes. Luxeon colour changing LEDs, 1.2Watts. Photocell and time lock on/off. The judging decided to introduce a new category to reflect some entries, which did not fit easily into the original categories - for lighting in machinery. The application involved Philips Lighting working with Tesco for its freezer lighting solution installation across Tesco stores nationwide.